The Country Sisters are one of European top country music bands. 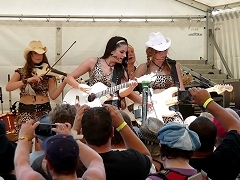 Based in the Czech Republic, the Country Sisters have been known for their high energy shows and unique entertainment. This extraordinary interview takes you behind the scenes with the Country Sisters. It was taped in Interlaken, where they shared the stage with the Bellamy Brothers, Tanya Tucker and Terri Clark. Look for a new part of the interview every morning until Christmas and you'll learn many facts you didn't know about. What usually makes you happy at concerts? Alena: "When there's a lot of people." Sonia: "When there is a solid supply of beer and nice fans. What in particular makes me happy is people who communicate with us during the show." Claire: "When people dance, clap their hands..."
Sonia: "When there's just a good crowd." Claire: "We get also grateful for a powerful fan in summer and powerful lights in winter." Sonia: "These are the things that make us happy on stage. In the matter of the surroundings of concerts, then it's ideal to have some great food and enough sleep after the show." Claire: "A pool at the hotel!" Sonia: "To have enough rest, to have enough time to put on make-up, get dressed, brush hair..."
Sonia: "A lot of nice boys around who would bring beer and flowers and such things!" Claire: "And then when it's fun and the show works out." Sonia: "And then when nothing gets fucked up like the drums don't stop and so on. There are plenty of things that make us happy."